How to Convert AVI to M4V for Apple TV iTunes QT iPhone iPad etc. If you have lots of AVI files, and an iPhone or iPad or Apple TV, you may need to convert these AVI files to M4V or other formats compatible with Apple devices. You can change AVI format to M4V online, requiring no register or third-party software. However, Online free video converters have limits of 100MB file size and 5 video files per day. And most users would have been frustrated by the delay in sending output profiles using online free video converters. Do not encode/decode AVI to M4V online. Here we introduce a much faster and efficient way to convert AVI to M4V without limit on the file size and number of videos you can convert. MacX Video Converter Pro is a highly popular AVI to M4V video converter for Mac and Windows, which is best known for its fast video conversion speed, high quality, various types of codecs and wonderful bonus features. 1. Convert AVI to M4V with the 5x faster speed than Handbrake or online free video converters and yet with minimum CPU usage, thanks to its leading hardware acceleration, HT tech, and multi-core CPU processing. 2. With the focus on video conversion, it can encode/decode AVI videos to M4V, as well as tons of other SD and HD/4K videos, such as MKV to MP4, AVI to MP4, WMV to MOV, M4V to MP4, MKV to MOV, M4V to AAC, and more. 3. Transcode AVI to M4V with 400+ profiles including the latest iPhone 8/X and other Apple Android devices. 4. Edit, crop, split, merge, trim videos, and add subtitles/watermark before conversion. 5. Compress AVI files to the smaller M4V file size without losing quality in several clicks. Click Add Video button and select AVI files from your computer to load. 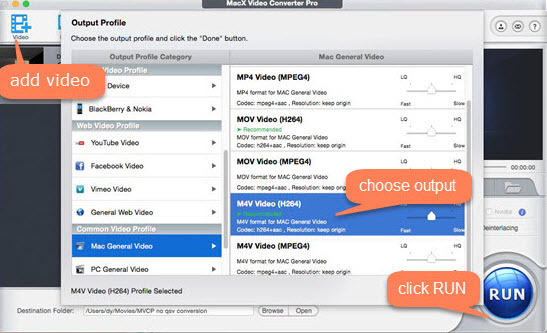 MacX Video Converter Pro supports converting AVI files to M4V in batch. Videos will be loaded immediately. On the popping up Output Profile window, click Mac General Video on the left pane and select M4V Video with H.264 codec, and click OK to save the setting. If you convert AVI to M4V to play on iPhone or iPad, click Apple Device under Device Profile category, and choose to directly convert AVI to iPhone, iPad, iPod, Apple TV, iTunes, iMovie, ProRes or Final Cut Pro. Click Browse button to select a destination folder to store converted AVI files. Then click RUN to start decoding AVI to M4V on Mac/Windows. 1. MacX Video Converter Pro can add SRT subtitles to AVI easily before formats conversion. 2. If the source AVI files are too large, follow guide to compress AVI to save storage space for iPhone iPad. 3. After the conversion is finished, transfer converted videos to iPhone iPad with MacX Mediatrans in a way easier and faster than iTunes. M4V file format is especially designed for iTunes by Apple to encode video files that may be protected by Apple's FairPlay copy protection. AVI is produced by Microsoft to contain both video and audio. AVI format is gradually replaced by MKV, Ogg and MP4. M4V files won't open and play in Android and other non-Apple devices. Users need M4V converters to solve such issue. And some M4V videos from iTunes come with DRM copy protection. AVI cannot contain some variable bitrate data. AVI is a quite out-dated format that has many drawbacks we won't see in MP4, MKV etc. M4V is compatible with Apple products, like iPhone iPad iPod Apple TV, iTunes, QT etc. AVI is widely supported by Windows and Android devices. To fast convert AVI to M4V format on Mac and Windows with zero quality loss, the No.1 fast video converter - MacX Video Converter Pro will satisfy your needs, which can convert AVI video to/from MKV, MP4, WMV, AVI, MOV, etc with optimal quality, thanks to its HT, HQ engine and hardware acceleration tech.